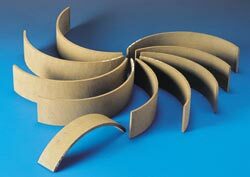 Asbestos based and Asbestos free Automotive Brake Linings by Hindustan Composites Limited. Catering to the needs of vehicle manufacturers and consumers in India and abroad, HCL has a wide range of asbestos - free and asbestos based automotive brake linings. The heavy duty brake linings find application in commercial vehicles including Tata, Leyland, Mercedes Benz, Volvo, Scania, and other widely accepted international vehicles. Its brake linings and disc brake pads are also used in light commercial vehicles and two-wheelers.